Check out our frequently asked questions below and get access to product resources. If you have additional support related questions, please fill out our Help Form. If you're looking to get information about buying the product, fill out our Quote Request. What are the system requirements for the Instadose+TM dosimeter? NOTE: Some anti-virus software applications must be temporarily disabled in order to allow the software and driver to be installed successfully. It is also possible that organization-specific security policies require administrative privileges to install these required components. Please consult your IT department for guidance. How should the Instadose+ badge be worn? Please consult with your Radiation Safety Officer (RSO) or account administrator for guidance on how to wear your dosimeter. Instructions for wearing a personal dosimeter vary by facility and are determined by local/state requirements. You will use the same username and password that you created during the purchase process. If you have forgotten your password, click on the Reset Your Password link (at the login screen) and follow the instructions to receive a temporary password by email. If you have forgotten your username, please call (800) 251-3331. How do I assign an Instadose+ device to a User? The Instadose+ reader software will be downloaded during the registration process. Each device must be activated by completing the four step registration process during which a device is assigned to a User. Each User is provided with a username and temporary password. The User will be prompted to change their password the first time logging into AMP (Account Management Program). No, all Instadose+TM and Instadose TM dosimeters have a unique serial number embedded into the device. Once the dosimeter is registered to an individual, that dosimeter is associated with that user/wearer. To obtain a dose read from the device, the assigned user/wearer (or an assigned account or location administrator) must login to AMP. Only those with access to the username and password associated with that wearer/dosimeter (or assigned account or location administrators) will be able to login to obtain a read from that dosimeter. How long can I keep an Instadose+ device? Unlike traditional (legacy) dosimetry badges that must be returned to the manufacturer for processing in order to obtain dose reads/measurements, the technology behind the InstadoseTM line of dosimeters allows users to perform their own dose reads remotely via the internet—completely eliminating the need to return dosimeters for processing. InstadoseTM and Instadose+TM dosimeters can be used continually by a wearer until the dosimeter reaches its end-of-life, which is approximately 5 years. Dosimeters are said to have reached their end-of-life when the internal battery or detector components must be replaced. No, a control badge is typically used to subtract background radiation exposure during transit and while the badge is stored at the customer facility. The advanced technology behind the InstadoseTM line of dosimetry products employs a sophisticated, proprietary processing algorithm that accounts for and removes background radiation exposure. The dose measurements you see reported are free of any background radiation dose amounts. If you forget your online password, simply click on the reset your password link at the login screen and follow the instructions to receive a temporary password by email. How often should I read my Instadose+ dosimeter? As part of a good “As Low As Reasonably Achievable” (ALARA) program, it is recommended that dosimeters be read at least once a month. Using the principles of ALARA means doing everything you can to minimize the affects of radiation to yourself and your patients. How do I know my Instadose+ device is working? Every time the InstadoseTM dosimeter is plugged into the USB port of your computer, self-diagnostics are run and any errors detected will be reported to the user, the account/location administrator (via email), and will appear in the account history for that dosimeter/user. Each time the Instadose+TM dosimeter is read, dose data is remotely transmitted to Mirion Technologies Dosimetry Services Division (DSD) secure servers where its proprietary systems, software and algorithms automatically run system diagnostics to identify and flag detector problems, read errors and anomalous data. When any problems are identified, they are immediately reported to the user, the account/location administrator (via email), and will appear in the account history for that dosimeter/user. Do I need to install any special hardware? No, but your computer must have a free USB port to insert the InstadoseTM dosimeter (featuring the instaLink TM-USB) and enable reading/transmission of dose data. Remote data transmissions for Instadose+TM dosimeters are enabled by Bluetooth Technology that requires an internet connection via a PC, smart device (phone or notebook), or an instaLink TM Hotspot Station. When using a PC, the InstadoseTM software (free) will automatically download to your PC during the AMP account registration process. When using a smart device, you must download the InstadoseTM Mobile App (free) from your iTunes or Google Play Store. Using a dedicated hotspot requires the purchase and installation of the instaLink TM Hotspot Station by your IT department. What address do I send payment to? For customers paying via a Purchase Order, orders will be shipped after payment is processed. 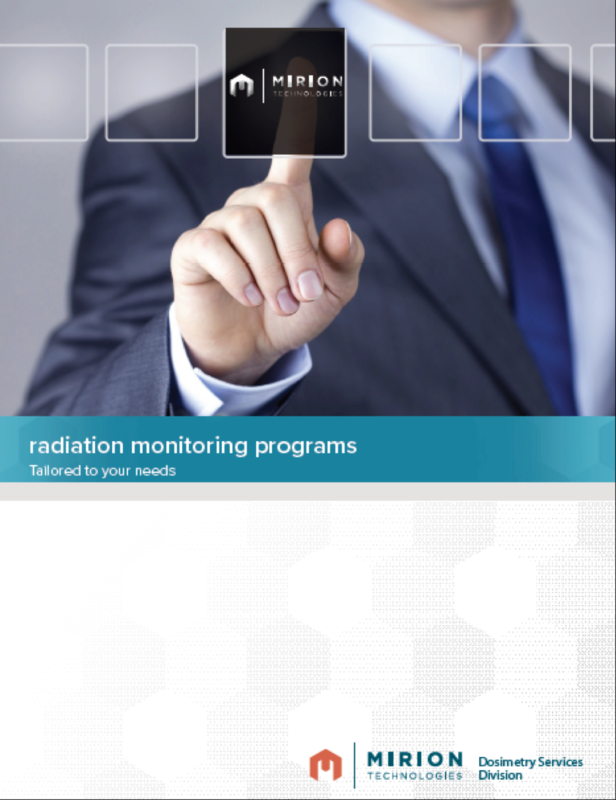 Download this brochure to learn how Mirion Technologies Dosimetry Services Division can help transform your radiation monitoring program. 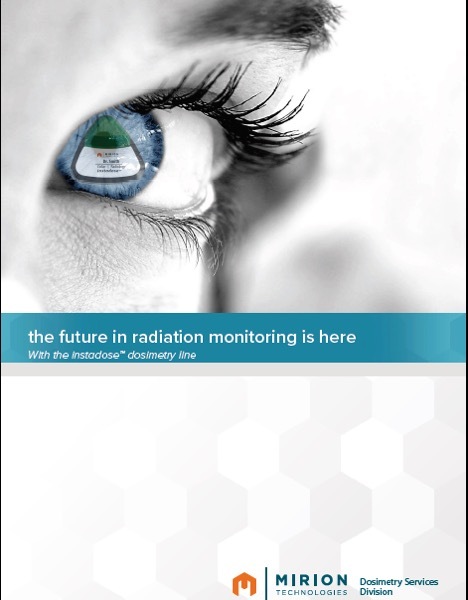 The Future in Radiation Monitoring is Here....Download the InstadoseTM Dosimetry Line brochure to learn more. Copyright 2019 Mirion Technologies, INC. All Rights Reserved.